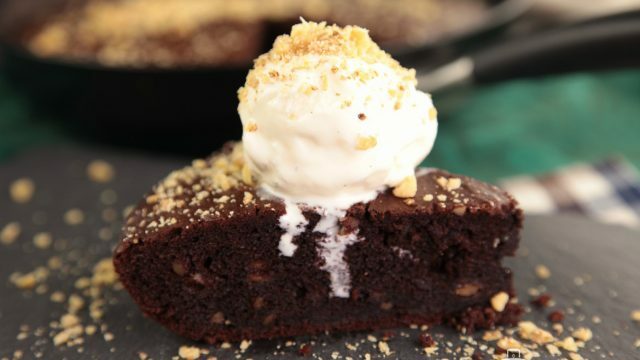 What do you get when you put Chocolate, Banana, Walnut and Ice cream together? Giving happiness is one of the best Christmas gifts, and you can be part of someone's happiness by preparing this easy-to-make Chocolate Banana Walnut Cake! The best Christmas gift to have it! 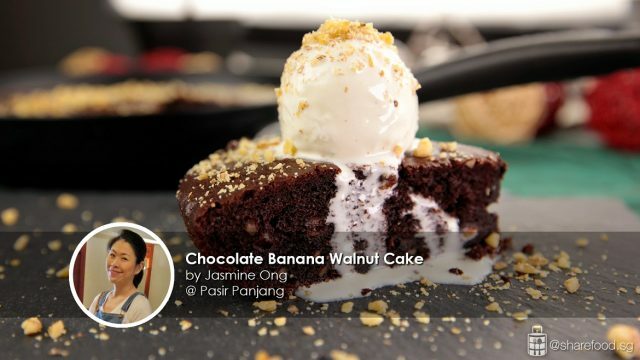 Our home cook, Jasmine Ong, shared with us this lovely cake recipe and her secret ingredient in keeping her cake moist is by adding a touch of sour cream. Just make sure you are using ripe bananas as they are sweeter in taste, it helps cover up the sourness from the sour cream. 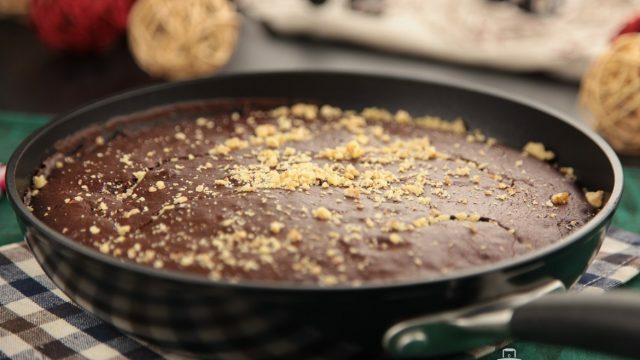 Fancy baking using non-stick pan? Yes believe in what you are reading now, we baked our cake using a non-stick open skillet which is commonly used for stir frying of home cook dishes. Fancy baking using non-stick pan? Into the oven and baked for <60mins! The Circulon Ultimum series can handle heat of up to 200°C (392 fahrenheit). 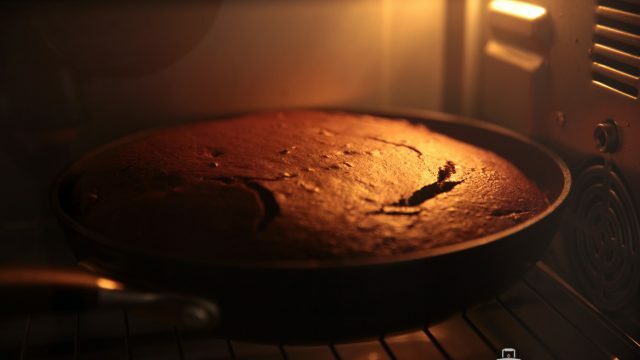 After baking it, add walnut topping to the chocolate banana cake. Yummy! This pan is the ultimate Christmas gift to all the home chefs. It can be used for stir frying of your regular home cooked dishes, and it can be used for baking as well. We featured our Baked Salmon with Crusted Pistachio last week, and the pan was also put to the test in the oven. The result? a perfectly cooked through tasty piece of premium salmon for your loved ones. We serve the cake together with a scope of devilish vanilla ice-cream, with that said, that explains why we used lesser sugar for this cake. Feel free to add another 50gm of sugar if you want it sweeter. Impress your loved one with this simple bit of joy! 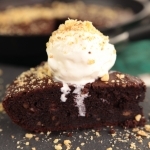 Chocolate Banana Walnut Cake recipe provided below! Mix the mashed banana and sour cream in a bowl. Set aside. Sift flour, baking soda, cocoa powder, baking soda and salt in a bowl. Set aside. Place butter and sugar in the mixer, whisk till pale and creamy at medium speed. Add in eggs one at a time, whisk till well mixed after the addition of each egg. Remove the mixing bowl from the mixer, fold in ½ of the flour mixture using a spatula. Add in the mashed banana mixture and combine it. Pour in the remaining flour and fold it evenly with the batter. Lastly, pour in the chopped walnuts, and give it a good mix. Preheat the oven at 180 degree Celsius for 20 mins. Pour the cake batter into the skillet and transfer it into the oven in the middle tray. Bake it for 45 to 60 mins. To test the doneness of the cake, insert a toothpick into the centre of the cake, the cake is done when the toothpick came out without wet batter on it.